Beer52’s first venture south of the Equator, our trip to South Africa has proven to be one of our most interesting to date. Beer52’s first venture south of the Equator, our trip to South Africa has proven to be one of our most interesting to date. We wish we could have stayed longer and will certainly come back. Along the way, we’ve discovered the best of the modern crop of craft breweries that the country has to offer. The highlight was the great team behind Devil’s Peak, easily one of the most exciting breweries in the world right now. Bringing you a diverse selection of beer styles that really highlight what they, along with other South African brewers including St Francis and Little Wolf are capable of, we think you’re going to agree that this is one of our most interesting boxes to date. But we haven’t just brought you a fantastic set of beers. 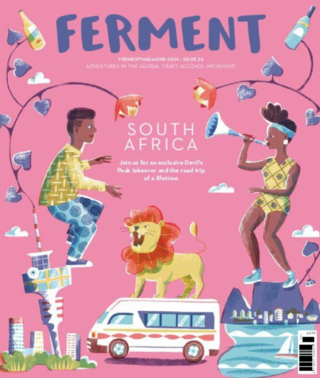 On the pages of this issue of Ferment, we would love you to join us as we explore everything that the ‘Rainbow Nation’ has to offer. We hope by the end of this trip we’ll all understand this vast and complicated country a little better. Perhaps you’ll plan your own trip here one day, but whether you do make a visit yourself or not, we are sure you will enjoy learning about our adventures in Johannesburg, Cape Town and beyond. A country with 11 official languages, a complicated and at many times dark history, this is a land of contrasts and contradictions. A country that is full of hope for the future, but that isn’t short of challenges. Between our visits to breweries, we drank beer with members of different parts of the South African population. Zulus, Afrikaners, Xhosa, Tswana, Tsonga, Sotho, Ndebele and immigrants from near and far who have fallen in love with the country and made it their home. We can certainly see why. The modern South Africa has a democratic, inclusive and progressive constitution. One of the first countries in the world to legalise gay marriage, seven years ahead of the UK, it is today a leading light of progress. But during its apartheid past, the country’s brutal regime separated its population along strict racial lines. Those scars are still being healed and race will be a major topic of conversation here for some time to come. Despite great progress and areas of huge prosperity such as Cape Town and Sandton (‘The richest square mile in Africa’), there is still a journey ahead. On Johannesburg boulevards with Maserati dealerships and vast gated villas, there are enterprising young people selling iPhone chargers, cleaning windows and scraping a living at almost every intersection. It would be unfair however to dwell on this point, for the image we are so often presented of Africa is one of poverty. In reality of course, that is only one part of the story. During our trip, we met the entrepreneurs and creatives who make this country vibrant, exciting and prosperous and are forging a renewed sense of national pride. If there’s something we have found to be as true here as anywhere in the world, it’s that beer has a special power to bring people together. On our journey, we learn about breweries founded by a diverse range of people. In townships and on 300-year old wine estates. By young, black entrepreneurs and American immigrants alike. These small businesses are creating employment and opportunity for people across the economic spectrum. Drinking beer together is one of the best methods we know of to learn about other people’s cultures and connect those from different backgrounds. What’s inspiring about the craft beer scene here is that breweries like Devil’s Peak see a big part of their mission to make craft beer inclusive, and for their products to go some way in furthering the journey towards social harmony within the Rainbow Nation and beyond.